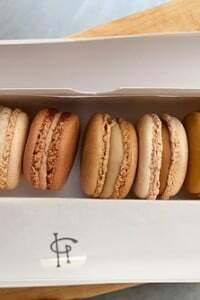 For some reason, the world went a little nuts for Parisian macarons in the past year and everyone, from New York to New Delhi, seemed to be fascinated by these little sandwich cookies. Notice that I said “Parisian” macarons, since you won’t find these too far outside of Paris. Folks in the rest of France make more traditional macarons, made from a simple meringue with sugar and nuts folded in, then baked until crispy. Parisian Macarons, as most of us know them, are said to have been invented at Ladurée, and they claim to sell 12,000 of them daily. When I Love Macarons! came out this year, the first run sold out immediately and the publisher scrambled to print more copies. Solid proof of the popularity of macarons, for sure. 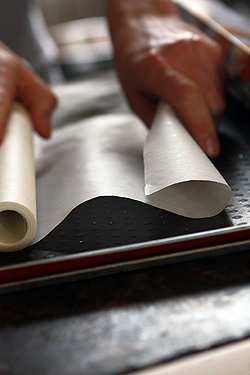 The book is a translation from a Japanese edition, written by pastry chef Hisako Ogita. It’s a slender volume, but has plenty of full-color photos and takes us step-by-step through the process of making macarons. Especially helpful is a great page with descriptions of troubleshooting tips, including pictures of common failures and how to avoid them. Bakers who’ve had a few ups and down making macarons would find this information of particular interest. I am not exactly sure why so many people want to make macarons. I usually tell them—“Come to Paris!” and buy them here. 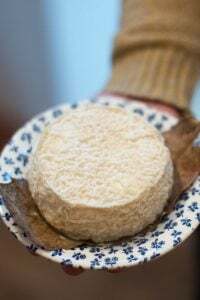 They’re not really something people would consider making at home: like baguettes and croissants, you’ll find them at many neighborhood bakeries and pastry shops, and even in the frozen food department of the grocery store. 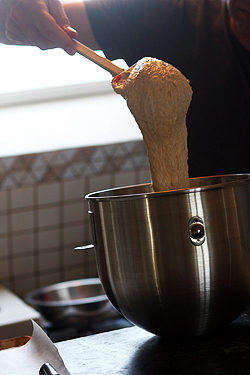 It’s like making your own hot dog buns if you live in America. It’s just something most people don’t do. But inquiring minds want to know, and several readers asked me what I thought of this book, which I included in my end of the year round-up of notable books. Once my copy arrived in the mail, I was anxious to get started. The book is basically a few master recipes with variations. A few people commented that the book is low on recipes and high on style, which is a fair comment. But there’s about thirty variations on the two master recipes, plus step-by-step color photos of each step of the process. So for the relatively low cover price ($14.95 list), I think it’s worthwhile for those interested in making macarons. The book was originally produced in Japan and is…well, very Japanese. When I showed it to Keiko, as she flipped through the pages, that was the first thing she noted as well. That means you can expect quite a few pictures of boxes of macarons tied with string, or a few wayward macarons accompanied by phrases like, “Crispy crust!” I find them cute, but I’m a sucker for anything food-related that’s Japanese. There’s a few oddities in the book, that I’d chalk up to unsuccessful translations. In the opening of the book, it says to “…use medium-size eggs”, although the recipes call for large eggs. And that if you want, you can bake your macarons in a “1500-watt toaster oven.” To be honest, I’m not sure how many people plan to bake two dozen macarons in a toaster oven. Under ingredients you’ll need, it says to use powdered sugar that doesn’t have cornstarch added, which the author notes can cause the macarons to crack. Readers are advised to find one that contains ‘oligosaccharide‘ which, as someone who’s baked professionally for a few decades, had no idea what that was. I’m wondering why they don’t just tell you to make your own powdered sugar in a food processor. (Puliverize it until it’s powdered.) I used regular powdered sugar, with cornstarch, and had no problems. Some of the flavoring amounts raised an eyebrow. I confess I didn’t make this variation, but one teaspoon of ground hazelnut powder would likely not flavor a few dozen cookies. And the ganache filling I made was quite runny and I added twice as much chocolate, and a pat of salted butter, to thicken it up. Lastly, when I read through the basic macaron recipe, there were pointers (and pictures) about mixing the ingredients in the whipped meringue a few steps before you even begin whipping the whites. I would’ve liked it in succession with the other photos and steps. As it was, I thought I was missing something and had to re-read it a few times. Since I write cookbooks, I’m chalking these quirks up to glitches in the translation and perhaps layout errors. And often authors aren’t in control of certain decisions, unfortunately. But still, I found the book utterly charming, but do wish there was a bit more oversight and these things were caught. Mine was a first edition, which sometimes contain “recipe gremlins”, as cookbook author Maida Heatter calls them, and hopefully they were rectified in subsequent editions. I decided on coffee macarons, and made them following the recipe and techniques exactly, from the grinding and double-sifting of the almond powder, to the macaronnage, the mixing of the ingredients into the whipped egg whites. The photos and descriptions were extremely helpful, and those into exactitude will be happy to know that Ogita tells one how many times to mix the batter once the almond meal mixture is incorporated. And the proof is in the pudding. Or in the macarons, should I say. When I checked mine in the oven at the halfway mark, i was delighted to find that they’d risen nicely and each had a perfect pied (foot), as promised. I couldn’t wait to fill them, which I made with some Japanese chocolate I had on hand, to keep in the spirit of the book. Aside from the variations in flavors you can create with the master recipe, the book also lists topping suggestions, such as cocoa nibs and black pepper, and various fillings, like caramel, rose water, and matcha, accompanied by a nifty color photo of each. I Love Macarons! also has suggestions for gift wrapping and presentations, plus a few recipes for using up those leftover egg yolks. In spite of some of the awkwardness, I appreciated the way the author explained each step as you go, with instructive color photos accompanying each step of the process. And when I was done, I realized the real reason one shouldn’t make macarons at home: It’s simply not safe being home alone with a few dozen chocolate-filled macarons. I love macarons. Never had them from Paris, but here in Zurich, they are since the 1950s a topseller in the most distinguished confectionery on place (Sprüngli). Great review and really appreciate the way you’ve given us both the pluses and minuses of the book. 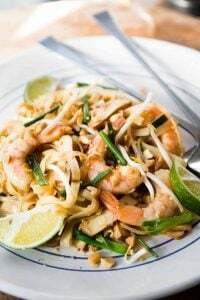 Far too many blog cookery book “reviews” recently where bloggers get the book, flick through and write a review – before ever trying any recipes within it, let alone including feedback on them in the review! I have this book, it is really pleasure to look inside the book as ther eis lots of pictures, but i do agree with the comment in your post, that the book is low on recipes and high on style. I doubt I’ll ever make them… as you say, I’d rather just go to Paris! Thanks for testing – they are all the rage now, but I prefer to have some of yours! I love the preciseness of Japanese recipes! There’s even a “recipe” for scotch and water that calls for stirring 7 1/2 times. Who counts 7 1/2 times when they stir? As an aside, Japanese eggs are sized differently–a medium egg is about 52 grams (without the shell), which is about the size of a large egg in North America. It’s great the editor (proofreader?) caught that there’s a difference, but too bad they didn’t change it in both the opening and the recipes. And you’d be surprised what Japanese people make in their toaster ovens! I have friends who bake breads and cakes in theirs! Rona: It was funny, because the recipe for chocolate ganache said to stir it “100 times”. I don’t know who has the patience to count to 100 when stirring (I’d just say, “Stir until smooth”, which is all you’re trying to do) but it’s certainly charming…and yes, I’d love to see someone baking these off in a toaster over. Although I suspect the one’s in Japan may be bigger than the ones people use in the states. I have never had macarons, but I am willing to try them because they look challenging and complex. I might veer towards something flower flavored…. I think french people want to make these at home because of the price, nearly 1€ (even more in paris) for 1 of those treat, c’est pas possible, là :/. If at least it was possible to eat just one ! The flavor in these is so complex and they look superb! I recently found macarons at a bakery in New Orleans called Sucre. They advertise them as “Frendh Macaroons” and come in assorted colors and flavors. I wonder if they taste like Parisian macarons and how they would ship. Thanks for the cookbook review — very informative. My sister lives on a US base in Japan, and she and a friend sold 1/2 size cakes at an American/Japanese festival last year, as they were still bigger than what the Japanese could fit in their ovens. Apparently their ovens are teeny-tiny! Another book which I liked and has been recently published is Solution Macarons published by Mercotte. David, what type of coloring product would you use in these, liquid, powder or gel? 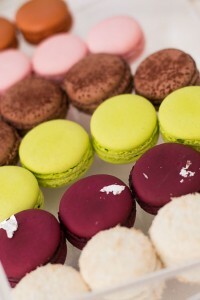 I think what intrigues me the most about macaroons are the beautiful shades of color they can be. They may have taken the world by storm but sadly they still have not made it to my corner of the Caribbean. Would you say that this book is a good book for a beginner – someone who has never made a macaroon before let alone even tasted one? So if anyone reading this is looking for a slightly easier recipe and/or doesn’t want to buy a book, you might check that out. I agree with one of your sentiments, “Why make them at home?”, though they are Gluten Free, they are best bought in a nice Patisserie not only in Paris, but also in other cities around the world. Even in Calgary. We have Yann Haute Patisserie, who’s selection really is amazing. Traditional and inventive at the same time. Heard so much about this book thanks to my current mac obsession. Love the coffee ones you tried, and love the feet! Loved the review too! One day I hope I shall win over these fiddly creatures!! Living on another continent, I wondered what all the fuss was about macarons. Are they the same cookie as macaroons, only filled? 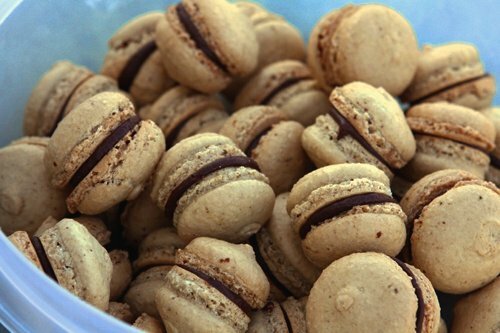 The Epicurious Dictionary lists “macaroons”, but not “macarons”, so it did not enlighten me. Maybe they are too new to be in their dictionary, though they do have a recipe for macarons. Thank you for clearing up the macaron mystery. I too have noticed the popularity of macarons here in the States. I was confused because I do not remember them being little sandwiches. The macarons from my childhood were just little meringue cookies, no filling. Everyone here also seems to confuse them with macaroons which of course are coconut cookies popular at Passover. Nice article and review. I find your distinction between Parisian and provincial macarons a little strange- you’ll find sandwich macarons to die for in Lyon. If you don’t believe me, try the coffee macarons at Bouillet (http://www.chocolatier-bouillet.com) or the tarte tatin ones at Richard Sève (http://www.chocolatseve.com/). Or maybe not, these biscuits are more addictive than crack. And, they’re cheaper than their parisian equivalents. This is one of those confections where I send the recipe to my cousin and convince her to make them for me. She is a much more precise baker than I am. We will have to make them before the bridal shower we are throwing in a month. 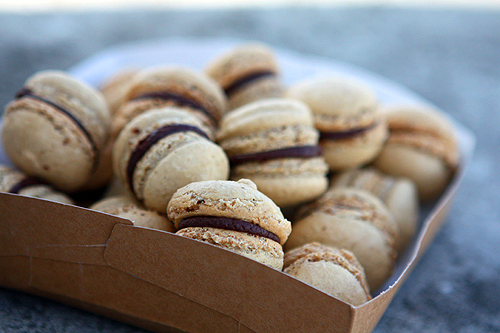 These would be perfect on the dessert table, since it is a French themed party. My first and only attempt at macarons was from this book, I Love Macarons. Unfortunately, I had mixed results. Some with feet and some without. I think I will use a recipe from another source next time to see what happens. Better yet, I will just have to pick up some next time I get to Paris! I’ve tried croissants and champagne in my real life; both are from France but definitely not macarons. Thanks David for bringing this up, would love to try them someday! Love your blog, love your books, Love your recipes and your personal touch! That said, Have you had any experience making Macarons, or indeed any other egg white confection at altitude? The French: Hmmm, you might have been gazing a bit too long at the outtake for that meringue shot? Claudia: I don’t have much experience at high altitude baking, but you might want to check out Letty Flatt‘s book, Chocolate Snowball. Am not sure if she has a recipe, but she is the expert on all-things high-altitude. Eating in Lyon: While it’s true that they can be found in other cities like Lyon–and Los Angeles, London, and elsewhere, I believe their claim that les macarons Parisien were popularized, and likely invented in Paris, at Ladurée since the story seem plausible to me. But I’m always interested in hearing more about where things like this come from, so if there’s another story out there, it’d be interesting to know more about it. Last year I was in Zurich for work and basically lived on macaroons. I was actually at the airport, with my last 10 euros left in hand, and spent 9 on macaroons for the plane! David- does this book include a variation recipe for champagne flavored macaroons? Those were my favorite! Why make them at home? Because it’s fun! A good tip for avoiding those curlicues on top is to pipe the cookies from the side, nozzle of the pastry tip practically touching the cookie sheet. And apparently, opening the oven midway through baking is a good idea, as it lets some of the steam escape, preventing cracks. 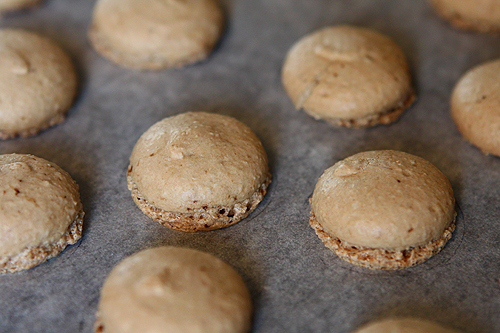 This site also includes a recipe for macarons with a raspberry/orange blossom water filling. It looks divine and may prove the perfect recipe for my first attempt at macarons. But aren’t macaron aesthetics a huge part of their delight? Looking at the different sources, it seems like the first Parisien macarons were simply two “provincial” macarons stuck together with buttercream. It’s a different type, and the different flavours developed after that, but I don’t think it’s fair to call it a new invention. Maybe it’s the same story with the credit for the first sandwich. It looks like they all came in from Italy, spreading through the south of France. But, admittedly, this comes from reading wikipedia, the musee des macarons site and a couple of others, so don’t take it as gospel. Very nice review of the book. I just wonder if it has recipes of a fusion between macaroons and Wagashi (Traditional Japanese Sweets made of Rice Flour and Bean Paste)? I agree with Cindy, in that they are certainly different from the macaroons seen in the US at Passover–coconut macaroons. However, I have seen something quite similar sold pre-packaged in supermarkets in the US and they are meringues, which makes so much more sense and look like those in the photos. Two completely different items, or so it seems. Eating in Lyon: I hadn’t read the Wikipedia.fr entry on les macarons parisien previously but from what I learned when I went to Ecole Lenôtre, that jibes with what our chef instructor told us. The Ladurée history is pretty interesting. Brian: There are a couple of macarons that use Japanese ingredients (matcha, kinako, and red bean paste), but there are no wagashi-like variations. 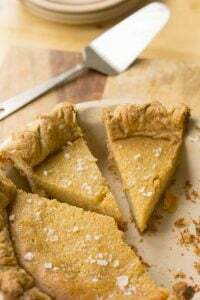 picky picky: The book has 2 master recipes, and the one using Italian meringue is said to have shinier, crispier shells (and to keep longer) than the principle recipe in the book, which is the one I used. If you have the book, and you give the Italian meringue recipe a try, it would be interesting to see the difference. The longer i live in Europe the more i learn about macarons and the more I’m noticing them…like last night when i watched Marie Antoinette (again) and took note of the beautiful, bright, endless supply of macarons dotting her quarters. Also, i was just in Paris last weekend and enjoyed Laduree’s for the first time ever (though the salted caramel left a little something to be desired). and now I’ve noticed that macarons are sold in Switzerland – in the German part! :) thanks for sharing your thoughts on this book! David, just a few days ago I blogged about macarons and in that post I mentioned both this book and you. I attempted to make macarons at home without ever having tasted a real one, and I found your blog to be an incredible resource for learning how. Thanks so much for a great blog – it is always such a wonderful read. My wife and I have a cheese and wine shop in New Braunfels, TX, where we also sell hand-made chocolate truffles, but I have to say that the macarons we carry are hands down my favorite thing in the shop. They’re flash frozen and shipped from Paris. I’ve thought about trying to make them here, but must confess that I would definitely eat most of them myself! David’s right: it’s not safe being home (or anywhere else) alone with a few dozen macarons. 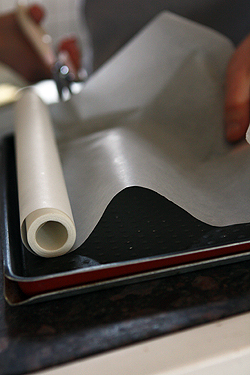 As a student at the French Pastry School in Chicago I love reading your blog. We recently made macarons in petit fours class and then had to take them all home and eat them. Thankfully they freeze well. I do not have the book you talked about but it is on my ever growling list of books to get. While I won’t be making macarons at home any time soon as my kitchen is officially smaller than my closet I do enjoy getting them from Chef Demitri Fayard’s, one of my instructors, bakery Vanille Patisserie. If you’re ever in Chicago his shop is worth the visit. Well, I’m one of those a little beyond Delhi (in Goa) who did go nuts about macarons. We don’t really like them they’re too sweet for our tastes. But what it is for me, about Parisian macarons, I think is mastery over this finicky cookie! That’s pretty wierd about the oligosaccharide recommendation re: powdered sugar. Oligosaccharides (3-10 sugar units) are intermediate between mono or di-saccharides and polysaccharides. Since pure sugar is just sucrose (which is a disaccharide), using pulverized granulated sugar wouldn’t provide for oligos. I’ve never seen powdered sugar with maltodextrin (an oligo) or any other oligosaccharide. I wonder if they’re referring to a natural source or an industrially produced oligosaccharide…. David, don’t you love the Chocolate Snowball book? 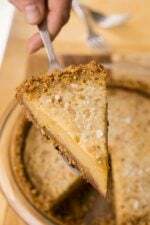 The frozen lemon pie is demanded by my friends continuously–I’m having trouble getting them to allow me to make other desserts. I’ve told many people about this cookbook, but no one has heard of it. You’d be surprised what those of us living in Asia make in toaster ovens (though it’s a bit bigger than what Americans think of as toaster ovens). Ovens are rare in kitchens here (I live in Hong Kong), because many Asians don’t bake; a toaster oven is my only option. Case in point: I’m making a wedding cake in mine. good write up, loved seeing macaroon’s top of the blog having been away in Paris for the last week! I tried nearly all of the flavours at Lauduree, well 9 different flavours and would have got some more on Friday if I didn’t have to rush off to get a train in order to make my way home earlier than expected! I’d not had them before but loved them, favourite being caramel with it’s rich sweet taste reminding me a little of treacle. 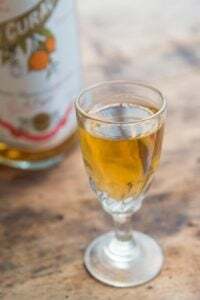 Liquroice was also impressive, i’d read a review before I went from someone who said he didn’t expect to like it but found it to be his favourite and I agreed that it doesn’t taste too much of liquroice until a little after taste. Also Thanks for your Paris suggestions David. I took a print out of all of your recommendations and ended up going to Jadis and to Au Gout Dujour (note there dinner has now gone up to 25 euro but is still a great deal). Both places served excellent meals and aren’t places I would have found myself in otherwise! I now need to go back to go through the rest of the list! I bought this book about a month ago, and have since made two batches: one rose and another pistachio. The macarons themselves were fine, but did you find the size a problem? I first measured the 1.5cm circles asked for, and they were WAY too small – I ended up using my piping bag nozzle, which was approx. 2.5cm – a much better size! So, in the movie *Marie Antoinette* Coppola is just having fun when she’s passing them around? 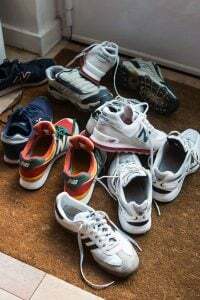 Like the tennis shoes and rock music? i can’t put my finger on it – but i’ve wanted to make these things for a while now too. i think it’s because we made all sorts of pastries in cooking school, but never macarons (it was a “general” program, not just pastry…) and since i’ve heard they’re so hard i have felt compelled to give them a whirl, although after a year, i still haven’t :). this post of yours might push me over the edge !! I do agree with your review that there are some quirks in the book that make the order of steps a little confusing. 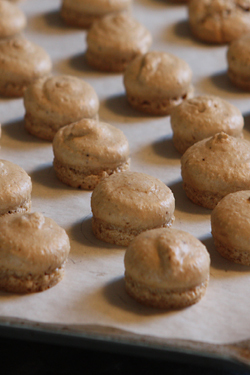 However, I found the pictures immensely helpful and I produced my most successful batch of macarons yet. I have access to fairly good macarons in the bay area, but do not like paying $2 per little cookie when I know the ingredients are cheap. I was also charmed with the flavor suggestions of roasted soybean and purple yam. These will have to suffice until I make it to Paris. I am partial with these little delicate treats. Have you seen them made as a lollipop yet? What a sight that was and they taste so good still! Hhmm! Perfect timing: I just opened your post whilst nibbling on a couple of rose and coffee macarons. I used to have to go to Laduree in London for my favourite treat but have recently found a tiny French patisserie called Cocoa in Brighton which makes macaroons as good as Laduree. Unfortunately they only do three flavours – rose, pistachio and coffee – but boy, are they delicious! Hi David. I have been waiting for your review of the book as I’ve read similar comments from other bloggers. Perhaps the 1500 WATT toaster oven are being referred to those counter-top ovens that’s very popular in Asia. People bake everything in those small little ovens (just a little taller in size than our toaster ovens) including macarons. Hi David — a friend gave me your book, “The Sweet Life in Paris…” after I returned from a week cooking with Patricia Wells. I wish I had read it before I was there. I had no idea there was so many foodies from the States living part-time, full-time or most of the time in Paris. For now, I’ll savor the book and look forward to my next trip. Shoshana: I did use a larger pastry tip than was advised, but I did draw circles the diameter that was recommended in the book. Mine rose quite high and normally I make mine a bit wider, too. Janice: She’s great, and glad you’re enjoying the book, too! Janet: I did like the book, too. 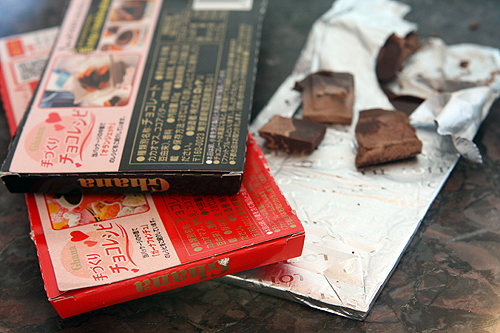 I was interested in trying the kinako variation but was concerned about using 1 teaspoon of kinako powder. In The Perfect Scoop, I have a Kinako Ice Cream recipe and found it takes quite a bit of that powder to give the right flavor. Linda H: Letty’s book is really great and I recommend it to anyone interested in high-altitude baking. It’s such a specialty and she’s the go-to person, as far as I’m concerned. Just a quick note to let you know I love your candid review! One always appreciates when one can know they are going to get the real deal. That and so much more brings me back repeatedly to your blog! 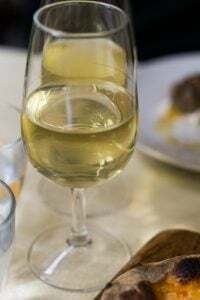 I have featured your blog, and your Saveur Award at Cookbook Club 101 today. Congratulations! and thank you for always bringing us the very best. I can’t remember that I ever even tried macarons (or maybe I was so unimpressed, that I forgot all about it) BUT they look so nice and cute on your photos, that I will give it a try now. Hi, I have the same book. I’ve made macarons from different recipes countless times, the only time it was decent was when i was supervised. I feel so stressed out just thinking about making them that i have given up. I wonder how important it is to sift the almond and icing twice. Yours looks lovely. I only wish that I could walk into a pastry shop and purchase macarons! Most people here have not even heard of them yet (I am working hard to correct that). I have to admit, the first successful batch of macarons that I have ever made came of this book :) I have several Japanese cookbooks (oh yes, all of them have some translation issues) and wasn’t surprised by the attention to detail. 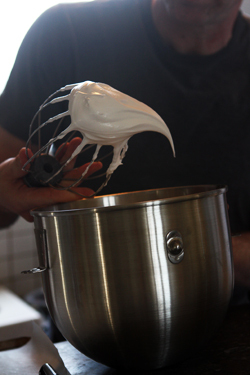 It was very different for me to work the batter off the sides of the bowl like that. I too wished the notes regarding the meringue were mentioned before instead of towards of towards the end of the process. 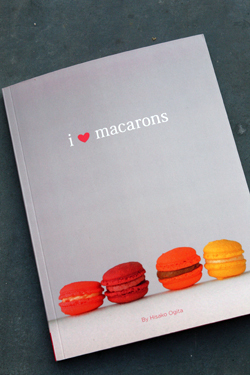 It is a very cute book with a lot of ideas for different variations of macarons. I just made my first successful batch of real macarons. They have wee feets and everything!!!!! Chocolate filled with fig. i remember seeing this book in anthropologie when i was visiting nyc last fall. i LOVE all the books in anthropologie, they’re all so pretty. but i never buy any. i was tempted though. might have to check it out, if not just for the very fun japanese touches. as i just translated a french dessert cookbook, i’m curious to see the quirks too. thanks for the tip on the cuisto cooks site by the way. i just received your new book today, can’t wait to devour it. Thanks for the book review David, I was on the fence about purchasing this book and now you’ve cleared all my doubts! I find that the cover of the book is especially adorable! After reading your “I love macarons” posting, I ordered the book and made two batches tonight. The first batch got the foot but the foot spread out, it became a skirt instead. I decreased the oven temperature and it saw improved result with the second batch, But both batches produced hollow and rather low macarons. What am I doing wrong? I am going to try your chocolate macaron recipe next. I love macarons, but – like kouign amann or cafe au lait- they always taste better in France (probably a placebo effect). I simply can’t wait until we learn how to make them at Le Cordon Bleu later this term, yay! ;) One of the many reasons I’m in love with my school! 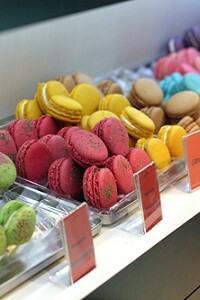 Oh, I adore macarons and miss them as much as I do pâtes de fruits. Both are on my list to make, although I know it won’t be quite the same as when I first had them there. Thank you for your wonderful information as I refer to it when I delve into the world of macaron making. I just got this book over the weekend and am looking forward to trying it out. Thank you for the detailed comments. But I wanted to know how do the patisseries like Fauchon and Le Notre get their macarons so shiny? Geri: In the book, there are 2 master recipes; the Italian-meringue one will yield shinier caps. 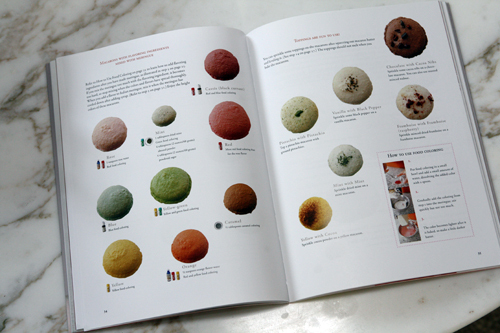 Klara: As mentioned, there are pages with examples of macaron troubleshooting issues, including color photos, that are in the book that can help. Also check my Macaron Tips & Techniques post, for troubleshooting advice. Do you use supermarket-bought poudre d’amandes or..? I brought back two bags of it when i last came home from France but haven’t had the time to test it yet! I had exactly the same problem with the ganache recipe – far too thin and liquid! I did the same and added some more chocolate and butter and it thickened up nicely. I used supermarket bought ground almonds and just pushed them through a sieve a few times to make them super fine – they worked perfectly and i had no lumps. My first macarons attempts came out looking perfectly Laduree-esque if I do say so myself, with only a few of them containing air pockets. All my research before attempting to make them definitely paid off! I love you. I just made my first batch of macarons ever. They came out perfect! AND DELICIOUS! I can’t tell you how happy I am right now! THANK YOU! David, I am challenging you to a macaron-off. My friend took me to a bakery a year ago to sample some macarons, and I instantly fell in love with them, so when I found this book in San Francisco I immediately bought it because of the sheer cuteness of it. However, the general consensus about the book is that it’s heavy on style and light on precision. A reviewer left a pretty thorough comment on how the measurements will not yield satisfactory results, but your results seem to look pretty perfect. My batch on the other hand was pretty terrible. I’m not sure whose recipe to follow, but I hope my next batch turns out as nice as your’s.